In the boxes: Fried chicken, saba fish, snow peas, cherries & corn. I tried to do a full body ninja but failed.... So here's the head of the ninja, did at the last mins. The alphabets & ninja is cheese. Z is into ninja now, so he was happy when he saw this. L doesn't mind having something like this. Phew! 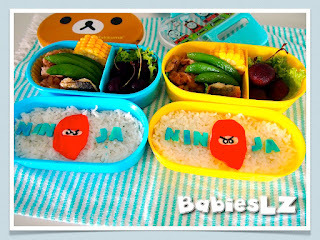 If I prepare girly bento for Z, think he would protest! Coz his friends often crowd around him to see what's in his box. I don't think I like that too if it's me. Cute is ok for him but not girly. 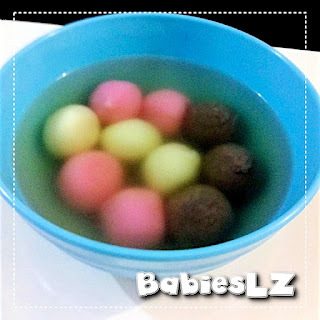 We had 汤圆 this evening. My kiddos don't fancy it but naughty mommy insisted that they must have at least one!